Up for global premiere at the forthcoming 2017 Shanghai Auto Show in April, the brand new Vision E Concept has been released through images by Skoda. It looks spectacular and proves our guessing that it is going to be a coupe based on the Kodiaq but there are more details than just meeting the eye. The all-new Skoda Vision E Concept is indeed going to be a electrically propelled vehicle with two motors that are good enough to generate a maximum power output of 306 PS and with the help of a lithium-ion battery pack the futuristic vehicle can run up to 500 kilometers on a single charge and presumably the battery pack is placed in such a manner to provide optimum weight distribution and greater handling. This goes on to show that the production version of the Vision E Concept will play a significant in the Czech Republican brand’s addition of five eco-friendly vehicles by 2025 across different segments it competes in or expects favourable sales from. Alongside the EV nature, the Vision E also ticks the self-driving level 3 criteria according to reports. It implies that the electric vehicle is capable of driving itself independently on traffic, make overtakes, seek parking spaces, etc courtesy of the sensors and camera employed to enable full autonomous capability in different road conditions. When the teaser image was released showcasing the roofline, we predicted it to be a Kodiaq Coupe and now the entire design can be examined thanks to the two official drawings. First and the foremost is the coupe-like silhouette bringing a tear-drop attitude to the EV. Next, it comprises of an aggressive front fascia with Skoda badge positioned at the centre of the signature bulge just above the thin headlamp LED strip. It has end-to-end light system at the lower portion of the bumper as well as hidden door handles, slender tail lamps, a bulky side profile and a tidy tailgate. Unfortunately, no pictures of the interior have been released yet but don’t worry as we got everything covered when it makes public debut on April 19. 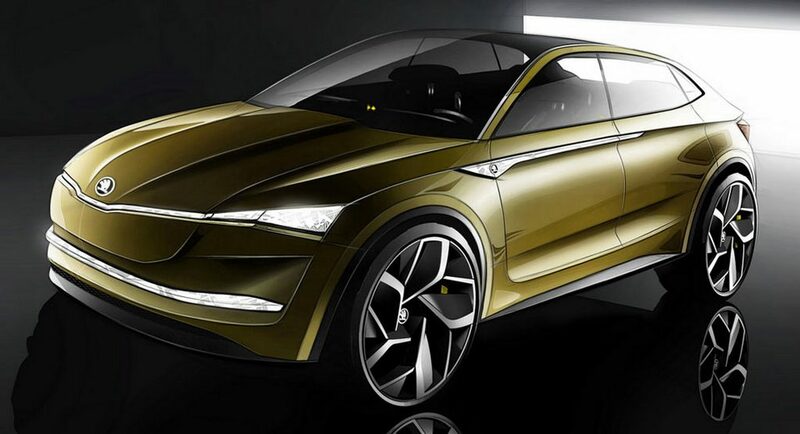 The Skoda Vision E Concept measures 4,645 mm in length, 1,917 mm in width, 1,550 mm in height and has a wheelbase of 2,850 mm.